An ambulance carrying Dr. Martin Salia, a surgeon working in Sierra Leone who had been diagnosed with Ebola, drives to the Nebraska Medical Center in Omaha, Neb., Saturday, Nov. 15, 2014. 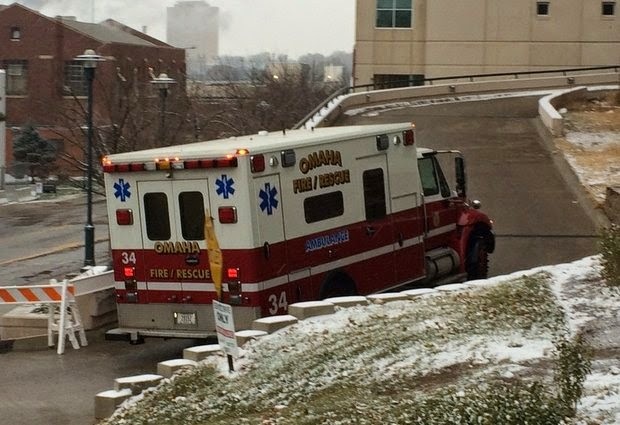 Dr. Salia is the third Ebola patient at the Omaha hospital and the 10th person with Ebola to be treated in the U.S.
OMAHA, NEBRASKA. (AP) — A surgeon who contracted Ebola while working in Sierra Leone was in extremely critical condition Sunday at a Nebraska hospital, his doctors said. Dr. Martin Salia, who was diagnosed with Ebola on Monday, arrived in Omaha on Saturday to be treated at the Nebraska Medical Center's biocontainment unit that has successfully treated two other Ebola patients this fall. Salia is "extremely ill," said Dr. Phil Smith, who is helping oversee Salia's treatment. The 44-year-old Salia might be more ill than the first Ebola patients successfully treated in the United States, according to the hospital. "This is an hour-by-hour situation," Smith said Sunday, adding that a team of specialists is treating Salia's most serious issues. "We will do everything humanly possible to help him fight this disease." Ebola has killed more than 5,000 people in West Africa, mostly in Liberia, Guinea and Sierra Leona. Of the 10 people treated for the virus in the U.S., all but one has recovered. After Salia arrived in Omaha, his ambulance to the hospital was accompanied by a single Nebraska State Patrol cruiser and a fire department vehicle — a subdued arrival in contrast to the August delivery of Dr. Rick Sacra, whose ambulance was flanked by numerous police cars, motorcycles and fire vehicles. Salia, a Sierra Leone citizen who lives in Maryland, first showed Ebola symptoms on Nov. 6 but tested negative for the virus. He eventually tested positive on Monday. The U.S. State Department said it helped facilitate the transfer of Salia; the U.S. Embassy in Freetown said he paid for the expensive evacuation. The travel costs and care of other Ebola patients flown to the U.S. have been covered by the groups they worked for in West Africa. Salia's wife, Isatu Salia, said in a telephone interview that when she spoke to her husband early Friday his voice sounded weak and shaky. But he told her "I love you" in a steady voice, she said. The two prayed together, and their children, ages 12 and 20, are coping, Isatu Salia said, calling her husband "my everything." Nebraska Medical Center spokesman Taylor Wilson said members of Salia's family were not at the hospital Saturday, but were expected to arrive "in the near future." Sierra Leone is one of the three West Africa nations hit hard by an Ebola epidemic this year. Five other doctors in Sierra Leone have contracted Ebola, and all have died. Gresko reported from New Carrollton, Md. Associated Press writers Clarence Roy-Macauley in Freetown, Sierra Leone; Mike Stobbe in New York; and Matthew Barakat in McLean, Va., contributed to this report.